Ice trays and lunch boxes were piling up in the bottom of the pantry, but when had I tossed the long straws down there? I kept bumping them for a couple days. They kept reaching up to attack me. That's when I realized: Another bag of potatoes is growing in my pantry. Everybody has something hiding in their closet! This predicament never bothers me as much as it should although this time it was a little creepier. I still had room in the raised bed where I had planted the last bag of potatoes. Yep. This was the second bag of potatoes I had grown in the pantry during this Spring planting season. Think of it like getting tomato seeds started early! you will also find out about the third potato crop! It's growing potato plants on my front porch! Somehow, I always miss a couple when I dig them and so every year we grow potatoes from potatoes in that same soil in that same pot. Yes, I go through it carefully. It will happen to you too, just you wait! Maybe I should cook more? Keep track of my groceries better? There are people who think I have it all together. No, really. There are even a couple who are intimidated by my got-it-togetherness. Those same people are way too organized to be attacked by eight inch potato fingers reaching up from the floors of their pantries. Thing is: potatoes are EASY to grow. Especially the brown ones that come in a bag from the grocery store. They produce really well! Much better than all those specialty purple and yellow finger varieties that have to be special ordered. And if they are harvested young, they can be cooked whole without chopping! I love no chopping! The little potatoes don't have the pasty texture of big potatoes either. Two more great reasons to do some pantry-started potato planting! You might be picking up on a theme: Potatoes aren't my favorite vegetable. But I do like the little ones. This crop of potatoes didn't get carefully chopped into cubes like the last bag. The growing season was well under way and potatoes don't like heat. These got buried whole about two inches under the surface. 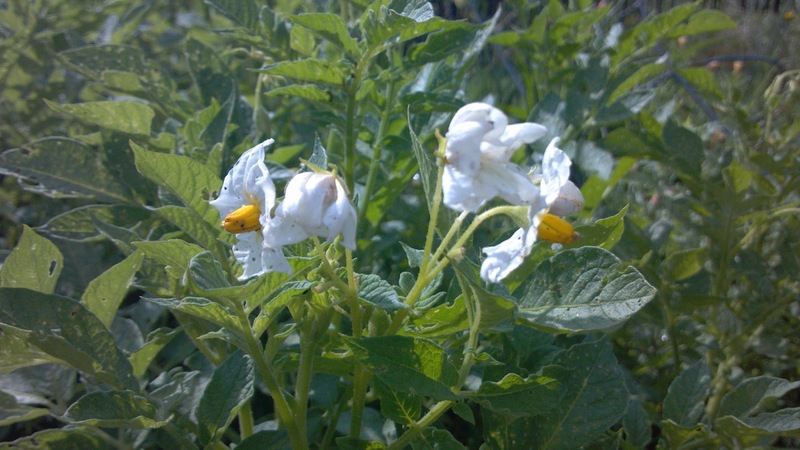 The third potato crop is one of the specialty varieties that I special ordered. They are called "All Blue" and are purple on the outside and the inside! They live in the flower pot on my porch. They don't produce many potatoes but they do come up every year and flower. If I fertilize them, they are very pretty. This is their sixth year. This year they will be harvested and the soil dumped into the garden. Next year I will start with fresh "All Blue" seed potatoes that I will order. I'll boil all the little potatoes cut some in half to show off their color varieties, and coat them in melted butter. Yum! "All Blue" taste like regular potatoes, they just look weird. I won't forget the eat potatoes now that they are in the garden!! There is a very funny video about them too: OMG! More potatoes! The Million Dollar Dress and the Onions.